The Channel Islands Chapter has been together since the early 1990s. Inge McClurg approached Carol Ellinger to start a Gold Star Wives Chapter in Ventura County as there are two military bases only twelve miles apart from each other: Naval Air Station, Point Mugu and Ventura County Joint Base formally know as the CBC Base. The group has a core of six women who meet once a month at the Bard Mansion aboard the Base on the third Tuesday of every month except for July and August. The Chapter does have a membership of thirty-six members and many are World War II widows or Vietnam widows. Over the years there has been joint ventures with other GSW chapters in the Southern part of California. Our Chapter members and members from the Golden State Chapter have attended the Medal of Honor Dinners when they were held at the Reagan Library in Simi Valley and we have enjoyed Regional Conferences with members from all eleven chapters in the Southwest Region. Our Chapter has only had three presidents in its existence: Joyce Sihler was president for eight years and Nancy McKenzie was president for six years. Carol Ellinger is the president now and all the ladies who attend our meetings hold a position in the Chapter. Each woman attends Veterans Day and Memorial Day ceremonies in their respective areas: Nancy in San Barbara, Joyce in Oxnard, Inge in Camarillo and Carol in Ventura. The Chapter has hosted two Regional Conferences. Our Chapter is held together because each lady believes in the Purposes of Gold Star Wives. 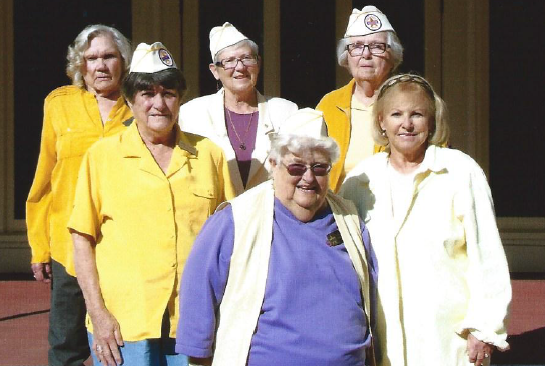 The Chapter members in the picture are in back row (l to r) Lucille Gaskins, Inge McClurg, Nancy McKenzie, Carol Ellinger, Joyce Sihler and Ingrid Church.